Lightharmony.com - Feel the light - What Are You Guys Smoking? 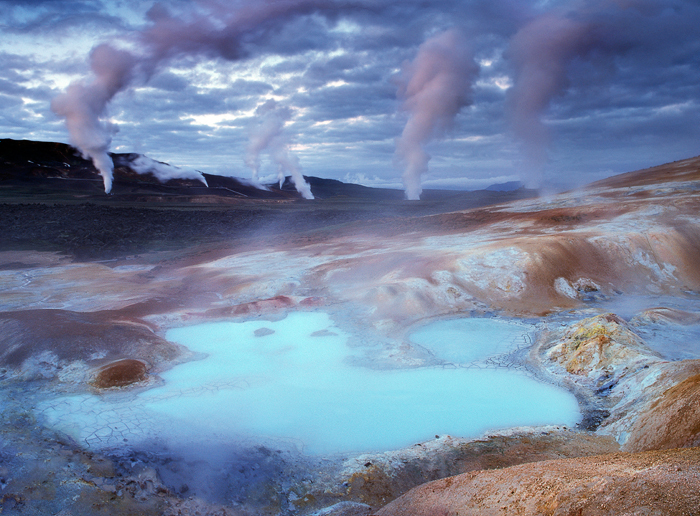 A passerby can see the smoking land of Krafla from the main road that runs in a distance of few kilometers. Just one sight would make you change your travel schedule in case you have not planned to visit it. Not so massively marketed, it's perhaps one of the most bizarre hence interesting places on Iceland. If you ever had all those romantic dreams about exploring the surface of the Moon, they will come true here (okay, there are no fences and wooden pathways on the Moon protecting you from stepping on hot fumaroles but other than that, prepare for heuristic feelings when walking around, especially when coming at night). The place is just stunning - formed by various lava fields (be mossed or just plain from the latest eruption in 80's), sulphuric steam vents, craters, boiling mud pots, colored mineral deposits.